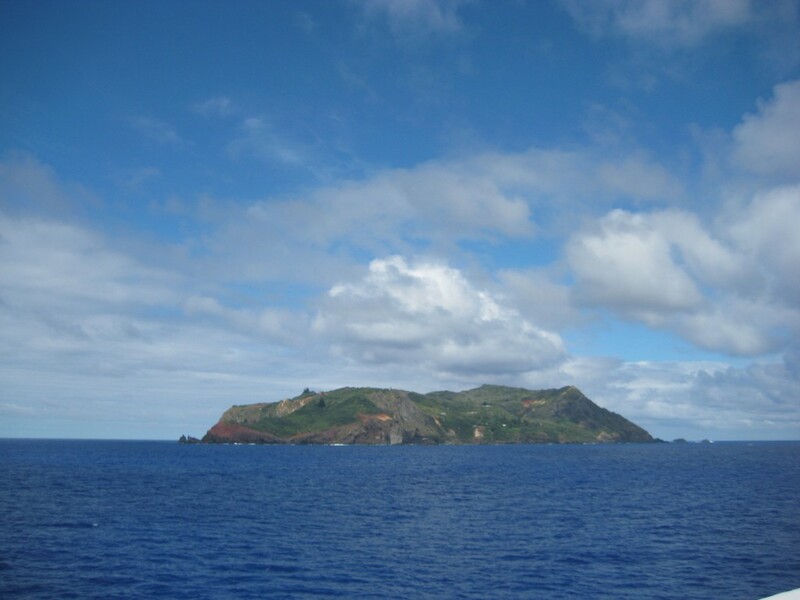 On this day we cruise the island of Pitcairn which was discovered on July 3, 1767 by the crew of the British sloop HMS Swallow and was named after Robert Pitcairn, a fifteen-year-old crewmember who was the first to sight it. In 1790, the mutineers of HMAV Bounty and their Tahitian companions, some of whom had been kidnapped from Tahiti, settled on Pitcairn Island and set fire to the Bounty. Today, the island is inhabited by fewer than 60 people, from nine families, making it notable for being the least populated jurisdiction in the world. Its largest population was in 1937 with 233 people, but through emigration to New Zealand the population has dwindled. The island has quite fertile soil and is able to produce a wide variety of fruits and vegetables. Fish are plentiful in the sea, so nearly daily someone goes fishing. The Pitcairners are involved in creating crafts and curios mostly of Miro wood, which is a dark, durable and beautifully grained wood. Typical carvings are of fish, sharks, whales, turtles, as well as walking sticks, vases and wood boxes. Pitcairn also produces some of the finest honey in the world, which they export to New Zealand and the United Kingdom. Also exported under the brand “Delectable Bounty” are dried bananas, papayas, pineapples and mangoes. Typically the ship would allow the Pitcairners onto the ship to give a talk about the island and to sell their handicrafts and honey but not this time. A ship that visited the island a couple of weeks ago brought the flu virus, which has been so prevalent in the U.S. in recent weeks and nearly a third of the population was ill. The captain was not willing to allow the islanders onto the ship from fear they would bring the flu bug onto the ship. Because of this we were only able to cruise around the island before setting sail for Tahiti. Before we left the MS Amsterdam fulfilled the islanders wish list for items like meats, poultry, ice cream, soft drinks and liquor, which were donated to the locals. This was accomplished by the islanders coming out to the ship in a motorboat and ship’s crew throwing boxes of goods to the islanders. This minimized the risk of crew catching any germs. The island is fairly small, measuring about two miles across, but is very green looking with steep cliffs and jagged rocks at the point that the island meets the sea. We could see several homes and buildings on the island, which looked fairly simple and plain. Clusters of pine trees were visible from the coast but otherwise there was not much to see from the sea. This evening we were invited to join the captain for a cocktail party and dinner in the specialty restaurant called the Pinnacle. Each formal night the captain hosts one of these parties for the passengers until all of the guests have had a chance to be included. Cocktails and appetizers were served in the Wajang Theater, which had been converted to a party room with tall cocktail tables draped in white linens. Crewmembers who were dressed in all black served the guests. A five-course dinner was served in the beautiful Pinnacle restaurant, with an officer seated at each table. We were seated at a large table for ten with officer Frizzo who is the second in command, and his girlfriend, Jennifer, who works in the front office. The meal included a cup of soup, a starter of lobster skewers, a green salad, a lamb entrée and a medley of chocolates, cheese and coffee flavored gelatins for dessert. The entertainment tonight was a gentleman by the name of Nick Page who was a wonderful vocalist from London’s West End. He performed songs from Michael Buble, Broadway, Frankie Valli, Pavarotti, Les Miserables and more. When we returned to our cabin after dinner there was a small plate of chocolates and a thank you note from the captain thanking us for coming to the dinner. We also received a two-piece ceramic tulip vase as our gift for tonight’s formal night. The vase has an illustration of a building in Holland where they grow tulips.